Wound repair is a quiescent mechanism to restore barriers in multicellular organisms upon injury. In chronic wounds, however, this program prematurely stalls. It is known that patterns of extracellular signals within the wound fluid are crucial to healing. Extracellular pH (pHe) is precisely regulated and potentially important in signaling within wounds due to its diverse cellular effects. Additionally, sufficient oxygenation is a prerequisite for cell proliferation and protein synthesis during tissue repair. It was, however, impossible to study these parameters in vivo due to the lack of imaging tools. Here, we present luminescent biocompatible sensor foils for dual imaging of pHe and oxygenation in vivo. To visualize pHe and oxygen, we used time-domain dual lifetime referencing (tdDLR) and luminescence lifetime imaging (LLI), respectively. With these dual sensors, we discovered centripetally increasing pHe-gradients on human chronic wound surfaces. In a therapeutic approach, we identify pHe-gradients as pivotal governors of cell proliferation and migration, and show that these pHe-gradients disrupt epidermal barrier repair, thus wound closure. Parallel oxygen imaging also revealed marked hypoxia, albeit with no correlating oxygen partial pressure (pO2)-gradient. This highlights the distinct role of pHe-gradients in perturbed healing. We also found that pHe-gradients on chronic wounds of humans are predominantly generated via centrifugally increasing pHe-regulatory Na+/H+-exchanger-1 (NHE1)-expression. We show that the modification of pHe on chronic wound surfaces poses a promising strategy to improve healing. The study has broad implications for cell science where spatial pHe-variations play key roles, e.g. in tumor growth. Furthermore, the novel dual sensors presented herein can be used to visualize pHe and oxygenation in various biomedical fields. In multicellular organisms, acute (i.e. physiological) wound healing is a dormant mechanism to restore barrier integrity upon injury [1-3], and it comprises three major phases: (i) inflammation (e.g. leukocyte recruitment, secretion of cytokines/chemokines and growth factors), (ii) tissue formation (e.g. fibroblast and keratinocyte proliferation/migration, neoangiogenesis), and (iii) remodeling (e.g. by matrix metalloproteinases = MMPs) [1, 3-5]. In chronic wounds, however, this program prematurely stalls. Chronic wounds affect approximately 1-2% of the aging population in developed countries and thus pose an exceptional health and socio-economic issue . About a third of the dermatological health budget is spent on the treatment of chronic wounds, more than for all dermato-onocological indications (melanoma and other skin cancers) taken together [6, 7]. A plethora of factors may be the starting point for chronic wound development [8, 9], yet little is known about the precise mechanisms which prevent cells from restoring an intact epithelial cover. Understanding the spatial distribution of biological parameters in healing is crucial to elucidate their impact on the cells involved in wound repair. In recent years, gradients of signaling molecules have been found to govern directional cell migration in acute wounds [8, 10-12]. In this context, the wound fluid plays a crucial role [13-16] as spatial patterns of extracellular signals therein (e.g. cytokines, chemokines, and H2O2) are important in regulating wound repair [8, 10, 17]. Little is known, however, about equivalent mechanisms possibly present in chronic wounds. Extracellular hydrogen ion concentration (pHe) is precisely regulated and potentially important in signaling within chronic wounds due to its diverse cellular effects [18-21]. Additionally, cells involved in wound closure need suffient oxygen supply for upregulated energy-consuming processes, such as proliferation, migration, and protein synthesis [19-22]. Both pO2 and pHe are essential metabolic parameters which affect cell proliferation and migration [22, 23]. Our venture into this study was prompted by the fact that there is no satisfactory animal model for chronic wounds, and by the lack of tools for 2D-imaging of pHe and pO2 in vivo. For these reasons, the roles of pHe and pO2 in chronic healing of humans have hitherto remained poorly understood. The tools available (glass electrode for pH, Clark electrode for pO2) merely yield spot-measurements , and may not reveal possible spatial distribution patterns. 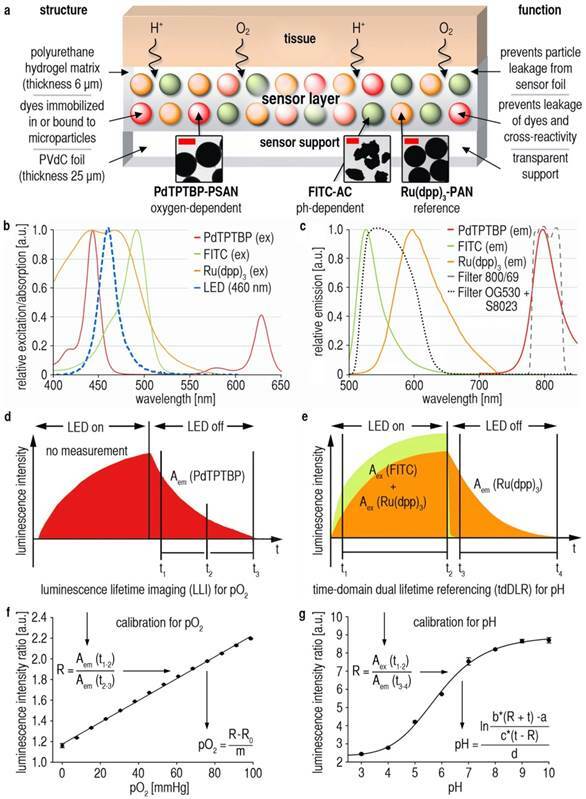 In contrast, luminescence imaging techniques are versatile tools to analyze spatial distribution patterns of biological parameters in live organisms [10, 25-27]. To address the questions raised above, we devised a 2D luminescent dual sensor for both pHe and pO2 based on our previous sensor concepts [28-31]. We subsequently used this sensor to visualize pO2- and pHe-patterns in human chronic venous ulcers, which represent the vast majority of all chronic wounds. We then studied the impact of the detected pHe-values on keratinocytes (which are essential for restoring an epithelial cover) in terms of proliferation, viability and migration (2D/3D wound healing assays, microfluidic cell migration assays). Additionally, proton transporter expression was investigated in biopsies from different regions in chronic wounds to elucidate how the pHe-variations are generated. To visualize 2D pO2/pHe-distribution in vivo, we devised a novel referenced luminescent dual sensor (Fig. 1A) based on our previous sensor concepts [30, 31]. We used palladium(II)-meso-tetraphenyltetrabenzoporphyrin in oxygen-permeable poly(styrene-co-acrylonitrile) microparticles (PdTPTBP-PSAN) as an oxygen probe [31, 32]. For pHe-imaging, pH-dependent fluorescein-isothiocyanate was covalently bound to aminoethylcellulose microparticles (FITC-AC). The pH-independent reference dye ruthenium(II)-tris(4,7-diphenyl-1,10-phenanthroline) was incorporated in oxygen-impermeable polyacrylonitrile microparticles (Ru(dpp)3-PAN) to prevent luminescence quenching via oxygen . Microparticles were embedded in a biocompatible polyurethane hydrogel layer on transparent poly(vinylidene-chloride) (PVdC) foils to prevent dye/microparticle exposure/uptake of cells, and to create a flexible 2D sensor [30, 31]. For details, see Materials and Methods. Following photoexcitation, luminescence was detected with a charge-coupled device (CCD)-camera. Signals were separated by optical filters (Fig. 1B,C), and by two referenced time-gated measurement schemes (Fig. 1D,E). Luminescence lifetime imaging (LLI)  of integrated signal intensities of PdTPTBP-PSAN in two time gates during emission decay (Fig. 1D) yielded intrinsically referenced pO2-values (Fig. 1F). Time-domain dual lifetime referencing (tdDLR) of integrated signal intensities during excitation (FITC-AC and Ru(dpp)3-PAN signals) and emission (only Ru(dpp)3-PAN signals) was used for referenced spatial pHe-detection (Fig. 1E,G) . For details, see Materials and Methods. There was no relevant dye bleaching , cross-sensitivity or temperature-dependency of pO2/pHe-signals (Additional File 1: Fig. S1). The dual sensor described herein has a response time (99% signal intensity change) of ~1 min towards both oxygen and pH as shown in previous works on sensors for pHe and pO2 [28, 30, 31]. Response time is mainly determined by the diffusion of oxygen and protons through the hydrogel layer, which therefore was kept thin (6 µm) in order to warrant fast response, in particular to pHe [28, 30, 31, 33]. It is also mandatory that sensor layers are well-conditioned (e.g. in Ringer´s solution, see Materials and Methods) prior to use. Oxygen diffuses quite rapidly through the PSAN copolymer microparticles, which are entirely impermeable to protons. Dual 2D luminescence imaging of pO2 and pHe in vivo. (A) Sensor foil scheme: Oxygen-dependent palladium(II)-meso-tetraphenyltetrabenzoporphyrin incorporated in oxygen-permeable poly(styrene-co-acrylonitrile) particles (Pd-TPTBP-PSAN), pH-sensitive fluorescein-isothiocyanate bound to aminocellulose particles (FITC-AC), and the pH-independent reference dye ruthenium(II)-tris(4,7-diphenyl-1,10-phenanthroline) in oxygen-impermeable polyacrylonitrile particles (Ru(dpp)3-PAN). Microparticles were embedded in a polyurethane hydrogel matrix on poly(vinylidene-chloride) (PVdC) foils. Dye leakage was prevented by binding the dyes to or incorporating them into microparticles. By embedding the particles in hydrogel, leakage of particles from the sensor was also prevented. The insets show transmission electron-microscopic (TEM) pictures of the sensor particles (bars are: left and right image 0.5 µm, middle image 2 µm). (B,C) Excitation (ex) (460 nm light emitting diode = LED) and emission (em) spectra of the sensor particles. Luminescence signals were optically filtered for pO2 (800/60 filter) and pH (OG530 + S8023 filters) visualization. (D,E) Detection schemes for pO2 and pH. Luminescene lifetime imaging (LLI) (D) was used for pO2-imaging. Luminescence intensities during emission were integrated in two separate time-frames, and a ratio (R) of these data gives a referenced signal for pO2. Time-domain dual lifetime referencing (tdDLR) (E) was used for pH-imaging. The combined signal intensities of pH-dependent FITC and pH-independent Ru(dpp)3 were integrated in a time-gate during excitation, and only the long-lasting reference signal of Ru(dpp)3 was detected in a time-gate during emission. The ratio (R) of these data gave a referenced signal for pH. (F,G) Calibration curves for pO2 and pH. Solving the linear fit for pO2 and the sigmoidal fit for pH enabled pO2/pHe-calculations for each pixel. Measured luminescence intensity ratios (R) obtained for each pixel were inserted in the respective equations to give referenced pO2/pHe-values, which displayed as pseudocolor maps to show the spatial distribution of these parameters. The (commercially available) polyurethane hydrogel chosen here is a trade-off between diffusion rates, biocompatibility, ease of handling and optical properties. Conceivably, similar polymers may also be used: other polyurethanes, hydrogels of the polyacrylamide, silamine, or glucosamine type, and respective composites . Another major concern is that horizontal analyte diffusion in the hydrogel might alter the spatial resolution over time. In previous works, we studied the spatiotemporal resolution of our sensor concept [28, 30]. This is important as two diffusion processes consistently and simultaneously occur: horizontal and vertical diffusion, both contributing to the final image. We studied the spatiotemporal resolution using continuous microscopic luminescence imaging of a drop (pH 8) on a sensor foil impregnated in a solution of pH 4. We were able to demonstrate that pH-values remain virtually unchanged over 30 min at a resolution of less than 5 µm . Horizontal proton diffusion is minimal as seen in our spatiotemporal microscopic imaging experiments . Similar experiments were done for pO2, showing that oxygenation can also be visualized at high spatiotemporal resolution [28, 31]. In humans, the vast majority of chronic wounds are ulcers caused by chronic venous insufficiency, i.e. reduced venous backflow from the lower limbs. Long-standing ulcers with no tendency to reepithelialize were specifically chosen (Fig. 2A, Additional file 1: Table S1). Sensors were then used to visualize pO2 and pHe in this wound entity. Spatial patterns of pO2 and pHe on chronic wound surfaces. (A) Photographs of chronic venous ulcers on the lower legs of patients. Scale bars, 1 cm. (B,C) Distribution of pHe and pO2 in chronic wounds. pO2-values range from 0 up to 60 mmHg with high spatial variability. pHe-values range from ~5 up to ~8 with high interindividual variability. In large areas, pHe increased from the wound peripheries towards the wound centers. (D,I) After defining the wound margins, mean pO2/pHe for the entire wound surface was calculated (E,J,G,L). (F,K) Self-programmed computerized macros (Materials and Methods, Macro S1) served to obtain pO2/pHe-data for the different wound regions. (G,L) Mean pO2 amounted to ~37 mmHg for the entire wound surface, and mean pHe was ~6.8. (H) A relatively homogenous distribution of pO2-values was found when analyzing data from all wound regions. (M) There were significant differences in pHe-values between the wound periphery and regions in the wound center. A pHe-gradient was found, starting with high mean pHe in the wound center (~7.4) and decreasing to low pHe near the wound margins (~6.5). n = 10, mean ± s.e.m., one-way ANOVA p<0.001, *p<0.05 in post-hoc Tukey-tests. It shall be noted here that the formation of air bubbles between sensor and tissue (when depositing the sensor film on the wound) is detrimental because it causes undesired effects: a delayed response to oxygen, a lack of response to pH (which is water-bound), and the formation of a reservoir for oxygen which heavily biases accuracy. Therefore, sensors were gently applied to wounds starting from one wound edge and were allowed to slowly adhere to the tissue surface by adhesion forces. The wound fluid, even if minimal, consistently allowed the foils to adhere to the wound surface. Foils were then photoexcited with LEDs, and respective time-gated luminescence signals for pO2/pHe were optically filtered and recorded with a CCD-camera using 2D-LLI/2D-tdDLR. We processed images with ImageJ to yield 2D pseudocolor maps of pO2/pHe in chronic wounds (Fig. 2B,C). To analyze 2D distribution of pO2 and pHe, we developed computerized macros (Additional file 5: Macro S1), capable of dividing imaging data from asymmetrical wound surfaces in 5 annular regions, each resulting from the percental distance (necessary for different wound sizes) from the wound margin. After marking the wound margins in the photographs (Fig. 2D,I), these contours were transfered to luminescence images, and these images were subsequently divided into annular regions (Fig. 2E,F,J,K). Mean pO2/pHe was calculated for each region per wound from all values found in these regions. Additionally, mean pO2/pHe was calculated for each entire wound from all values within the margins. For details on image processing, see Materials and Methods. Chronic wound surfaces were hypoxic at ~37 mmHg, with a mean pHe of ~6.8 (Fig. 2G,L), even though the epidermal barrier was absent in most areas. We have previously shown that one day after wounding pHe is above 8 and pO2 is ~60 mmHg, and that both parameters decrease during epidermal barrier restoration in physiological healing [30, 31]. Surprisingly, we found centripetally rising pHe-values in chronic wounds (Fig. 2M). Despite a high variability between the wounds in terms of size, shape and overall level of pHe, vast areas with centripetally rising pHe-values were found in the wounds. Mean pHe-values were significantly higher with increasing distance from the margins (periphery-pHe ~6.5, center-pHe ~7.4). No corresponding pO2-gradient (Fig. 2H) was observed, highlighting the fact that the pHe-gradient is not merely caused by the lack of a functional epidermal barrier. The degree of wound hypoxia measured here has been shown to critically impair keratinocyte proliferation and migration in healing [20, 22, 34-36]. We then studied the functional impact of the observed pHe-variations on epidermal barrier repair. Using pH-adjusted culture media (Additional File 1: Fig. S2), we first investigated pHe-effects on cell proliferation. With 3H-methyl-thymidine uptake as a marker for proliferation, we found a marked reduction of keratinocyte proliferation at the low pHe-values found at the wound periphery when compared to the high pHe at the wound center (Fig. 3A). Moreover, we found that cell viability, as measured via ATP-bioluminescence assays, was critically reduced at the pHe-values found at the outer wound regions (Fig. 3B) as compared to the cell viability at the pHe found at the wound center. WST-1 tests confirmed a rise in cell viability with increasing pHe (Additional File 1: Fig. S3). Therefore, keratinocyte proliferation and viability are reduced at the pHe found at chronic wound peripheries. Next, we studied how cell migration is affected by the pHe-values found in chronic wounds using 2D wound healing scratch assays (Fig. 3C) . We demonstrated that gap closure of keratinocyte epithelial monolayers is impeded by low pHe-values (6-6.5), whilst with rising pHe-values (7-7.5) the injured monolayer closed completely after 48 h.
To further investigate the effect of pHe on multilayered epithelia, we designed 3D skin constructs using keratinocyte/fibroblast co-culture. After wounding, a thin layer of pH-adjusted media (pHe 6.5 or 7.4), which served as a surrogate for the wound fluid, was pipetted onto injury sites in 3D skin constructs. Two days after wounding, histological evaluation revealed a multilayered epithelium on injury sites with pHe 7.4 media, which covered the entire wound area (Fig. 3D). No wound closure was observed in the wound models with pHe 6.5 media (Fig. 3D), demonstrating that low pHe inhibits multilayer epidermal repair, thus wound closure. To elucidate how pHe-gradients influence keratinocyte migration at the single-cell level, we devised a microfluidic cell migration assay . The pHe-gradients were established within the pHe-range measured in vivo (Fig. 3E, Additional File 1: Fig. S4). In this microfluidic assay, we observed that keratinocyte motility was lower at a pHe of ~6.4 as compared to higher pHe-values of ~6.8 and ~7.2 (Fig. 3 F-H, Additional File 1: Fig. S5, Movies S1-3). The migration velocity of keratinocytes increased significantly at higher pHe-values (Fig. 3I,J). Furthermore, the y forward migration index (yFMI) indicated that keratinocytes at low pHe of ~6.4 exhibit a low tendency to migrate towards higher pHe (Fig. 3K,L). yFMI of keratinocytes was highest at pHe ~6.8 (additional information on accumulated distance and endpoint y in Additional File 1: Fig. S6). As keratinocyte proliferation, viability, migration velocity, and the respective yFMI are critically reduced at the low pHe found at the wound periphery, keratinocytes may not be sufficiently recruited from the wound margins to restore an intact epidermal barrier. Furthermore, we found that keratinocytes cultured at the predominantly high pHe at wound centers secreted markedly more IL-6 and IL-8 (important direct and indirect mediators of keratinocyte proliferation and migration) [39, 40] when compared with those at lower pHe as found at the wound periphery (Fig. 3M, Additional File 1: Fig. S7). Impact of pHe on epidermal barrier repair. All experiments: human epidermal keratinocytes (HK), (A,B,I,K,M) mean ± s.e.m. (A,B) Proliferation and viability (also see Additional File 1: Fig. S3) of HK was significantly reduced at low pHe-values. n = 12, NS = not significant, one-way ANOVA p<0.001 and *p<0.05 in post-hoc Holm-Sidak test. (C) In a 2D scratch assay, there was almost no movement of the HK monolayer at low pHe of 6.0, whereas with rising pHe centripetal monolayer movement increased. Black dashed lines = migration front after injury, red dashed lines = migration front after the respective time, white arrows = regions of significant migration. E = epithelium, I = injury, n = 3. (D) 3D Skin constructs of co-cultured HK and fibroblasts. After mechanical injury, healing was studied with pH-adjusted media (as substitutes for the wound fluid) at the injury site. No healing was observed at low pHe 6.5 after 48 h, whereas at pHe 7.4 the wound was covered with a multilayered epithelium. Scale bars, 200 µm, D/E = dermis/epidermis equivalent, n = 3. (E) Chamber of a microfluidic cell migration assay. Pseudocolor scale and actual pHe-gradient (horizontally downscaled to show the gradient over the entire chamber) in the microfluidic chamber (visualization via luminescent BCECF). Numbers 1-5 denote regions for further analyses. HK (at 0 h) and according migration traces (colored) within 16 h are shown. Scale bar, 200 µm. (F-H) Trajectory lines of HK superimposed on coordinates (start at x/y = 0 µm). Mean slow cell velocity ≤ 12.6 µm/h, mean fast cell velocity > 12.6 µm/h. At low pHe, nearly all cells exhibited slow movement, whereas migration distance and the proportion of fast cells increased with rising pHe (E-H, results from one representative experiment, additional experiments/videos: Additional File 1: Fig. S5, Movies S1-3). n = 3 experiments. (I-L) Results from three microfluidic assays. Migration velocity (I) increased with rising pHe. The corresponding scatter point plot (J) shows results for all cells (red lines = medians). (K,L) y forward migration index (yFMI) was low at pHe ~6.4, and highest at pHe ~6.8. (L) red lines = medians. Together with velocity results, this demonstrated minimal chemotactic/migration activity at low pHe as found at wound peripheries. Cells tracked in 3 experiments: region 1 (n = 42), 2 (n = 60), 3 (n = 65), 4 (n = 69), 5 (n = 44). a.u. = arbitrary units, one-way ANOVA on ranks p<0.001 and *p<0.05 in post-hoc Dunn´s test. (M) Secretion of mediators of proliferation/migration, namely IL-6 and IL-8, is markedly increased at high pHe (see Additional File 1: Fig. S7). n = 3, one-way ANOVA p<0.001 and *p<0.05 in post-hoc Tukey test. To decipher how the pHe-gradients in chronic wounds might arise, we studied the expression levels of essential pHe-regulatory ion transporters in punch biopsies from human wounds (Additional file 1: Table S2). We assessed the protein expression level of Na+/H+-exchanger-1 (NHE1), a ubiquitously expressed transporter which is highly regulated (e.g. by cytokines, H2O2, reduced intracellular pH) [41, 42], and which contributes importantly to the development of acidic pHe, e.g. in carcinomas [41, 43, 44]. Immunofluorescence analysis of NHE1 in sections from intact skin, wound peripheries and centers (Fig. 4A,B, Additional File 1: Fig. 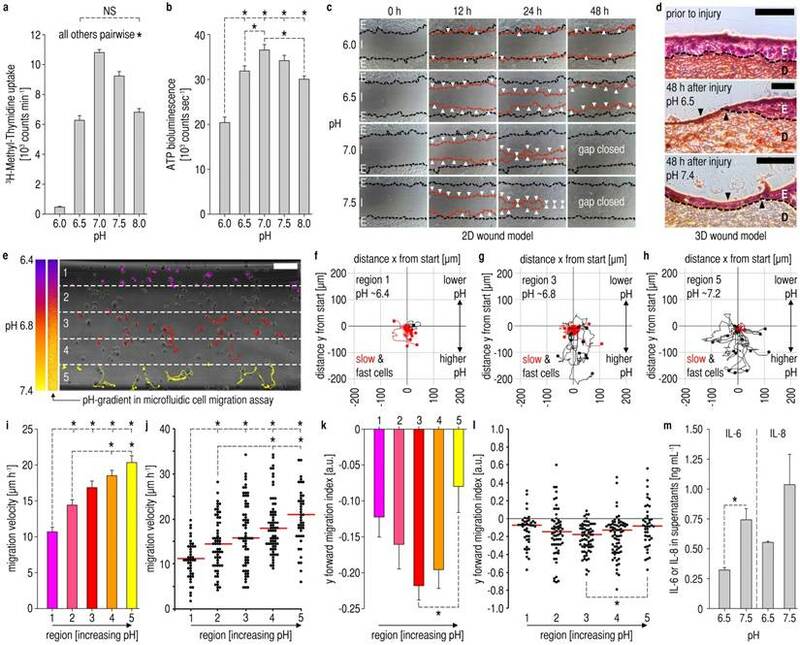 S8) revealed an increase in total and plasma membrane NHE1-density at wound peripheries, yet not at the central wound region, when compared with surrounding intact tissue. In the core of the wound, NHE1 protein-expression seemed to decrease strongly again, reaching a level similar to that in the normal tissue. For validation, quantitative reverse transcription PCR (qRT-PCR) for NHE1 was done (Fig. 4C), demonstrating a similar pattern of mRNA-expression, with greatly increased NHE1-mRNA-levels at the wound periphery, decreasing again at the wound center. Western blots confirmed the presence of a single band of the correct size for each transporter. Expression and localization of pHe-regulatory proton transporters in chronic wounds. (A-F) Three biopsies (adjacent intact skin, wound periphery, wound center) were taken from each patient (n = 3) and analyzed for proton transporter expression. The immunofluorescence images shown are representative of at least three different sets of images from each wound region. Sections were counterstained with DAPI (blue) for nuclei staining. Scale bars, 20 µm. (A-C) Representative (A,B) immunofluorescence staining and (C) quantitative reverse transcription PCR (qRT-PCR) of Na+/H+ exchanger-1 (NHE1) from adjacent intact skin, peripheral and central wound tissues from chronic wound patients. (A,B) NHE1-expression is strongly upregulated in peripheral wound tissue, but not in the central part of the wound. NHE1-antibodies were tested in Western blotting and found to produce bands of the correct size. Additional immunofluorescence images are shown in Additional File 1: Fig. S8. (C) mRNA of NHE1 was extracted from adjacent normal tissue, the wound peripheries and wound centers. We found that NHE1-mRNA was strongly upregulated at the wound periphery as compared to intact skin and the wound center. Mean ± s.e.m., n = 3. (D-F) The expression levels of the (D) plasma membrane vacuolar-type ATPases subunit B2 (ATP6V1B2) and the (E) (H+-lactate) monocarboxylate cotransporter 1 (MCT1) were not significantly upregulated in the peripheral and central wound sections as compared to intact skin. Additional immunofluorescence images are shown in Additional File 1: Fig. S9. Taken together, these results show that NHE1-levels are centrifugally upregulated in chronic wounds, and suggest that increased NHE1-mediated hydrogen ion extrusion acidifies the wound fluid with increasing distance from the center. To assess whether other pHe-regulatory transporters might exhibit similar gradients of expression, we performed immunofluorescence analysis for the (H+-lactate) monocarboxylate transporter 1 (MCT1), and for the vacuolar ATPase subunit B2 (ATP6V1B2). The protein levels of both transporters were virtually identical in intact skin, wound peripheries and wound centers (Fig. 4D-F, Additional File 1: Fig. S9). Taken together, these data are highly consistent with the observed pHe-gradient: NHE1-expression is upregulated at the wound periphery, and increased NHE1-mediated hydrogen ion extrusion acidifies the wound fluid with increasing distance from the center. It is, however, impossible to add an NHE1-inhibitor (e.g. 5´N-ethylisopropylamiloride = EIPA, cariporide) prior to measurements on humans to block NHE1-mediated acidification of the wound fluid. Gradient sensing is an essential biological mechanism governing directional cell migration in both prokaryote and eukaryote cells [45-50]. In physiological wound healing, gradients of growth factors (e.g. EGF) [8, 11], cytokines and chemokines , or small signaling molecules (e.g. H2O2)  have been shown to be decisive cues in mediating barrier repair. 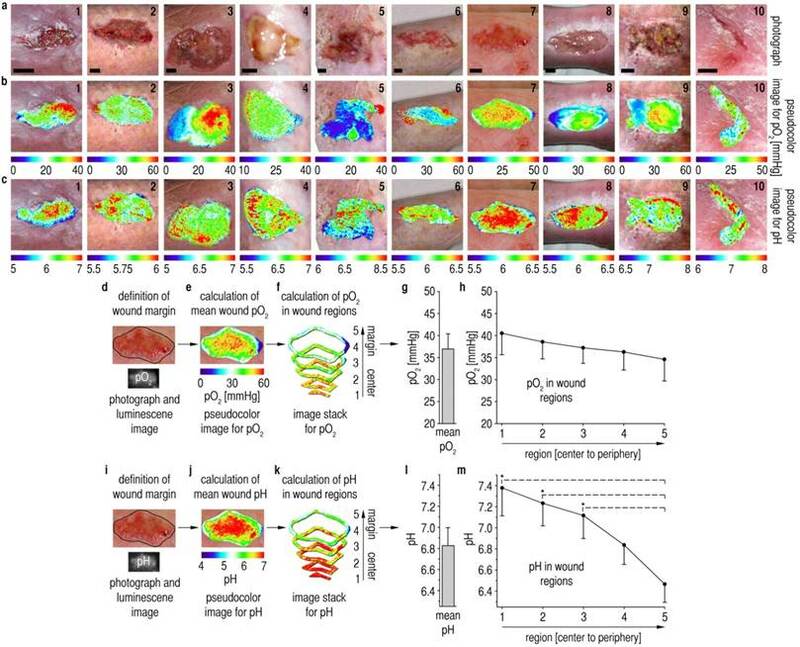 In this study, we showed that gradients of extracellular hydrogen ion concentrations exist on the surface of chronic wounds, and that these pHe-gradients negatively affect keratinocyte viability, proliferation and migration at the wound periphery. Decreasing acidity towards the wound center inhibits centripetal keratinocyte recruitment, thus preventing wound closure as shown in 2D and 3D wound healing assays as well as in microfluidic cell migration experiments (scheme in Additional File 1: Fig. S10). It has been reported recently for αvβ3 CHO-B2 cells and microvascular endothelial cells, that low pHe leads to increased integrin αvβ3-expression and subsequently reduced cell migration velocity [51, 52]. Based on our findings, this means that, at the wound periphery, these cells would be less motile and more prone to maintain their adherence, exactly at the region from which they are recruited from for healing. We also detected high levels of direct and indirect mediators of keratinocyte proliferation and migration, namely IL-6 and IL-8 [39, 40], at the pHe found at the wound center (Additional File 1: Fig. S7). 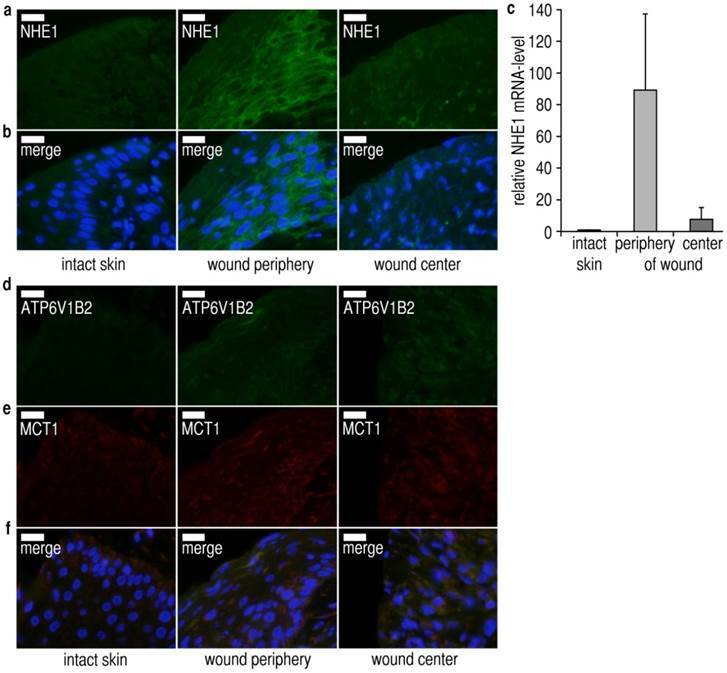 In contrast, keratinocytes secreted low amounts of IL-6 and IL-8 at the low pHe-values found at the wound periphery, which may also contribute to reduced centripetal keratinocyte recruitment. Another interesting finding was that interferon-γ (INFγ) release from keratinocytes increased with rising pHe (Additional File 1: Fig. S7). INFγ is known to stimulate VEGF production of keratinocytes , and VEGF is a key molecule in neoangiogenesis during healing. However, at the low pHe as found at the wound periphery, we found low levels of INFγ in keratinocyte supernatants. Therefore, the pHe-gradients found are possibly detrimental for neoangiogenesis at the wound periphery. More experiments have to be done to study the effects of the pHe-generated cytokine and chemokine secretion patterns on cell migration and proliferation. Additionally, the activity of MMPs involved in healing  is regulated by pHe, and it has yet to be shown how the varying pHe-values reported here affect these enzymes in the different wound regions. Next, we showed that the pHe-gradients found on chronic wound surfaces are predominantly generated via centrifugally increasing NHE1-expression. NHE1-expression is strongly upregulated at the wound periphery, and increased NHE1-mediated hydrogen ion extrusion acidifies the wound fluid in this region. Other acid extruding transporters, such as MCT1 and vacuolar type H+-ATPases, were not significantly upregulated at the wound periphery. The immunofluorescence and qRT-PCR data in conjunction with the measured pHe-gradients suggest that NHE1 is predominant, in accordance with its major physiological roles in acid extrusion. It is obviously impossible to add an NHE1-inhibitor (EIPA or cariporide) prior to measurements on humans. As NHE1 is the only NHE-isoform found in keratinocytes and epidermis , no other isoforms are relevant here. With respect to MCT-isoforms, no studies exist specifically addressing their roles in keratinocytes/epidermis. MCT1 is, however, the most widespread isoform, with MCT2, 3, and 4 showing much more restricted expression patterns. MCT2-expression is very low in human tissues (with the exception of testis), MCT3 is restricted to retina and the choroid plexus, and MCT4-expression is generally limited to tissues which use glycolysis for their energy metabolism (e.g. white skeletal muscle fibers, astrocytes, white blood cells, chondrocytes, certain tumor cells, cells under severe hypoxia) . Therefore, it can be concluded that no other NHEs than NHE1 contribute to the pHe-gradient, and that a major contribution from MCT2-4 seems very unlikely. Further, we describe, for the first time, the visualization of chronic wound oxygenation, and we found marked hypoxia (~37 mmHg), albeit with no correlating pO2-gradient. During physiological healing, we have previously shown that pO2 amounts to ~60 mmHg on the first day after epidermal barrier removal, and that pO2 gradually decreases during epidermal barrier recovery . Interestingly, pO2 in chronic wounds is markedly lower, despite the lack of epidermal coverage. Such low pO2-values critically impair keratinocyte proliferation [19, 20, 36] (partially by miRNA 210 upregulation)  and protein synthesis (e.g. cytokines, chemokines, growth factors), both processes being prerequisites for healing. Recently, it was also shown that hypoxia may partially arrest the cell cycle in keratinocytes via hypoxia inducible factor-1α (HIF-1α), which leads to miRNA 210-induced silencing of the transcription factor E2F3. HIF-1α is, however, also crucial for keratinocyte migration via regulation of laminin-332 . Other effects of hypoxia are mediated by miRNA 21, which silences early growth response factor 3 (EGR3). According to the literature , the pO2 of ~37 mmHg measured in this study may reduce keratinocyte proliferation by ~60% when compared to normoxic conditions. Hypoxia has, however, also been reported to be a stimulus for keratinocyte migration, yet most patients with chronic wounds are of advanced age, and it is known that hypoxia loses its potential as a stimulus for cell migration with increasing patient age [21, 56]. Therefore, we conclude that the low pO2-values we measured on chronic wound surfaces contribute to reduced keratinocyte proliferation and migration, thus impairing barrier rapair. Other miRNAs, such as miRNA-198, have recently been shown to be decisive factors in chronic wound healing . In summary, we present the first observation of presumably NHE1-generated pHe-gradients on chronic wounds. We further provide unique evidence for the notion that pHe-gradients inhibit keratinocyte supply from the wound margins in chronic wounds (Additional File 1: Fig. S10), a previously undescribed pathomechanism. Modulating pHe in chronic wounds poses a promising and feasible strategy for future therapeutics (e.g. dynamic hydrogels)  to improve patient outcomes. Hydrogels which restore a higher pHe in chronic wounds, especially at the periphery, might stimulate increased proliferation and centripetal migration of keratinocytes. pH-gradients also play an important role in tumor metabolism [43, 44], and therefore these findings provide evidence for a novel link between cancer and wounds in terms of pHe-regulated cell proliferation and migration . In humans, there are four proton-sensing G protein-coupled receptors (GPCRs), which are possibly involved in sensing the above-mentioned pHe-gradients: G2A (GPR132), GPR4, OGR1 (GPR68), and TDAG8 (GPR65) [60, 61]. These GPCRs are mainly activated when pHe drops below the physiological range, i.e. at the pHe-values we found at the wound periphery. Further studies should elucidate the role of proton sensing GPCRs in pHe-dependent cell proliferation and migration in wounds and tumors [43, 44, 59, 62]. The oxygen probe PdTPTBP (λex 444 nm, λem 797 nm, lifetime 50-300 µs depending on pO2, Sigma-Aldrich, Seelze, Germany) was incorporated into oxygen-permeable PSAN (30 wt% acrylonitrile content, Mw 185,000, Sigma-Aldrich) in a 1/50 ratio to form oxygen sensor beads (PdTPTBP-PSAN, diameter 0.5-1 µm). Polymer and dye were dissolved in dimethylformamide (0.12 mL per mg net weight, 60 °C). After cooling the mix to room temperature, particles precipitated under stirring (350 rpm) with the addition of distilled water (0.32 mL per mg net weight, drop-wise, 1 mL s-1). The solution was stirred for 30 minutes to ensure complete precipitation. The reaction can be scaled up to generate 250 mg of polymer. Particles were washed (6 x with ethanol, 8 x with distilled water), and filtered via centrifugation (10 min, 1,030 x g) after each washing step. Reactions were conducted at room temperature unless otherwise stated and particles were freeze-dried for storage (Modulyo, IMA Edwards, Bologna, Italy). pH-dependent FITC (λex 495 nm, λem 525 nm, lifetime < 5 ns, Sigma-Aldrich) was conjugated to AC particles (PreSens, Regensburg, Germany) in a 1/50 wt/wt ratio in sodium bicarbonate buffer (50 mM, pH 9, 1.8 mL per mg FITC) to form FITC-AC particles (2 h reaction time, diameter 0.75-3 µm). Residual amino groups on the particle surface were blocked with acetic anhydride (Sigma-Aldrich). FITC-AC was reacted with acetic anhydride and ethanol in a 1/2 wt/wt ratio (0.1 mL per mg AC, 12 h reaction time). Particles were washed (8 x with distilled water), and filtered via centrifugation (10 min, 1,030 x g, EDA12, Hettich, Tuttlingen, Germany) after each washing step. Ru(dpp)3 (λex 441 nm, λem 597 nm, lifetime ~6 µs, Sigma-Aldrich) was incorporated in PAN (Sigma-Aldrich) at a 1/50 ratio to form Ru(dpp)3-PAN particles (diameter 0.5-1 µm). Particles were formed by precipitating dye and polymer dissolved in dimethylformamide (0.2 mL per mg net weight) with distilled water (0.28 mL per mg net weight, drop-wise addition, 1 mL s-1) and the subsequent addition of Brine (0.08 mL per mg net weight). The reaction can be scaled up to 250 mg of polymer. Particles were washed (8 x with distilled water, 4 x with ethanol), and filtered after each washing step via centrifugation (10 min, 1,030 x g). Particle sizes were assessed with a LEO912 AB transmission electron microscope (Carl Zeiss, Oberkochen, Germany). The microparticle design efficiently prevents Förster resonance energy transfer (FRET). The microparticles (PdTPTBP-PSAN, FITC-AC, Ru(dpp)3-PAN) were mixed (ratio 2/3/1). The particle mix was dispersed (15 mg mL-1) in hydrogel solution consisting of 5% wt/vol polyurethane hydrogel (type D4, Cardiotech International Inc., Plymouth, MN, USA) in ethanol/water (90/10 vol/vol). This mixture was spread on a transparent PVdC-foil (thickness 25 µm, Saran plastic wrap, S.C. Johnson & Son Inc., Racine, WI) with a knife-coating device (K Control Coater model 101, RK Print-Coat Instruments Ltd., Litlington, UK) to form a 120-μm-thick film (Fig. 1A). After drying, sensor layer thickness was 6 μm. One mL of sensor mix generates a sensor film of 83 cm2. Imaging for pO2/pHe was undertaken using a time-gated imaging setup (ImageX TGI System, Photonic Research Systems, Newhaven, UK) with an integrated 12-bit CCD chip (640 x 480 pixels). The camera was combined with an array of light emitting diodes (LED, λ = 460 nm, Luxeon V Star LXHL-LB5C 5W, Philips Lumileds Lighting Company, San Jose, CA, USA) equipped with a FITC excitation filter (Chroma Optical, Brattleboro, VT, USA) (Fig. 1B). The LLI-scheme (Fig. 1D,F) was used for pO2-imaging (parameters: subtract background, 70 μs gate width, 1 μs delay time for window 1 and 36 µs delay time for window 2, 500 μs lamp pulse, 400 Hz recording frequency, 2 s integration time). An 800/60 nm bandpass filter (Omega Optical, Brattleboro, VT, USA) served to separate emitted oxygen probe luminescence from background and pHe-dependent signals (Fig. 1C). Triplicates of each image were collected in every measurement cycle. The tdDLR-scheme (Fig. 1E,G) was used for imaging pHe-distribution (parameters: subtract background, 5 μs gate-width, 5.5 µs delay time for gate 1, 0.25 μs delay time for gate 2, 6 μs lamp pulse, 400 Hz recording frequency, 100 ms integration time). The glass filters OG530 and S8023 (Schott, Mainz, Germany) were used as emission filters (Fig. 1C). Triplicates of each image were recorded in each measurement cycle. Participants were provided with verbal and written information on the study, and signed informed consent was obtained from each participant. The local ethics committee gave approval (University Medical Center Regensburg, No. 06/171: 2007), and experiments were conducted in accordance with the current revision of the Declaration of Helsinki. Impaired blood circulation (venous backflow, arterial inflow, microcirculation) is often a precursor to the development of chronic wounds. Study subjects were included based on the main causative disease being venous insufficiency, one wound diameter being at least 3 cm (for adequte analysis of signal distribution in an in vivo setting), and the absence of any healing tendency. Sensor foils were preconditioned (30 min, room temperature) in Ringer´s solution (B. Braun Melsungen, Melsungen, Germany) before use. Sensors were gently applied to the wound surface starting from one margin of the wound. Adhesion forces enabled the foils to adapt to tissue surfaces. The formation of air bubbles between sensor and tissue was thereby prevented and uniform contact ensured. We applied no pressure to the foils during measurements. The sensors remained on the wounds for 5-10 minutes and covered the entire wound surface and parts of the surrounding tissue. The distance between sensor and camera was focus-controlled (25 cm). All images were recorded >1 min after sensor application to yield sufficient sensor response (oxygen and proton diffusion). After recording oxygen images, the filters of the camera were changed and pHe-measurements were performed. For pO2/pHe raw data processing, integrated luminescence intensities in gate 1 were divided by the according intensities in gate 2 (ImageX software, provided with the TGI camera system, Photonic Research Systems). pO2/pHe raw data were stored as 16-bit black-and-white pictures (TIFF-format). The following processing steps were performed for each wound with Photoshop CS4 (Adobe Systems, San Jose, CA, USA): pO2/pHe raw data and a photograph of the wound were imported into one 16-bit PSD-file. The original wound picture was converted to grayscale and then duplicated. Layers were renamed: “Pseudocolor pH”, “Pseudocolor pO2”, “Photo”, and “Original”. “Pseudocolor pH” and “Pseudocolor pO2” were superimposed onto the identical real-color wound pictures (“Photo” and “Original”) using the transformation tool. The wound margins were defined in the “Photo” layers, and regions outside the respective margins were erased. The layer “Photo” was selected and the action “macro for preparation” (Macro S1) was started. Thereby, the size of the image was adapted and standardized, and the defined wound area was transferred to the raw data pictures. Subsequently, the pellucid region of the layer “Photo” was selected (“magic wand tool”) and the action “macro for slicing” (Macro S1) was executed. During this action, raw data were sliced into five consecutive regions, starting from the wound periphery towards the center. Next, the layer “Pseudocolor pH” was selected and the action “macro for measurement” (Macro S1) was executed. The grayscale mean value of the pHe/pO2-images from the total wound surface as well as from each slice were recorded using the “measurement tool”. The “measurement log” that buffers the data was exported to a CSV-file and imported into Excel (Microsoft, Redmond, WA, USA). The imported CSV-data were multiplied by a factor of 0.0022 for re-conversion to raw data values. These values were converted to respective pO2/pHe-values via the calibration equations (Fig. 1F,G). Pseudocolor image processing was done with ImageJ (http://rsbweb.nih.gov/ij/). For illustration purposes, pseudocolor maps for pO2/pHe on wound surfaces were superimposed to photographs using Adobe Photoshop (Fig. 2A-C). For 3H-methyl-thymidine uptake and ATP-bioluminescence assays, primary human keratinocytes were isolated and cultured as described previously . Discarded skin was obtained during routine surgical procedures (UK NRES approval: 06/Q1907/81) with the patients´ informed consent. The epidermis and dermis were separated by digestion with 4 mg ml-1 dispase (10 min, Invitrogen, Life Technologies Ltd., Paisley, UK) prior to liberation of keratinocytes from the epidermis by incubation with 0.5% trypsin (30 min, Invitrogen). Isolated keratinocytes were co-cultured with a feeder-layer of lethally irradiated 3T3-cells in standard Rheinwald and Green media (R&G) comprising DMEM and Ham's F12 medium (Invitrogen) at a 3:1 ratio, supplemented with 10% FCS (Gibco, Life Technologies Ltd., Paisley, UK), 10 ng mL-1 human recombinant EGF (Invitrogen), 10 nM cholera toxin (Sigma Aldrich, Gillingham, UK) and 0.4 mg mL-1 hydrocortisone (Sigma-Aldrich, UK). For water-soluble tetrazolium-tests (WST-1), adult human epidermal keratinocytes (HEKa, Gibco) were cultured in EpiLife medium supplemented with human keratinocyte growth supplement (HKGS, Gibco) and a Pen/Strep solution in a humidified atmosphere (37°C, 5% CO2). After reaching sub-confluency, cells were passaged using a 0.25% trypsin solution. For viability assessment and 2D migration assays, cells in passage 3 were used. In order to maintain experimentally induced variations in pHe, we modified R&G media such that DMEM was substituted with Hank´s buffered M199 media (Invitrogen) with reduced bicarbonate. Whilst maintaining a similar salt concentration, this substitution allowed a range of pHe to be stably maintained in ambient CO2 (also see Additional File 1: Fig. S2). Media was adjusted to pH 6, 6.5, 7, 7.5 and 8 with the dropwise addition of 1M HCl or 2M NaOH. Keratinocyte proliferation was assessed using a tritiated thymidine uptake assay. Cultured keratinocytes were seeded and exposed to pH-adjusted media as above. Keratinocytes were incubated with 0.5 µCi well-1 3H-Methyl-thymidine (PerkinElmer, Beaconsfield, UK) for a further 24 hours, lysed using 0.1% SDS and 0.1 M NaOH, harvested onto a filter mat using a Filtermate cell harvester (PerkinElmer, UK), and radioactivity was measured using a MicroBeta counter (PerkinElmer, UK) following the addition of scintillant. Keratinocyte viability after 24 hours at pHe 6, 6.5, 7, 7.5 and 8 (n = 12 each) was measured using an ATP-assay. Keratinocytes were seeded into 96-well plates (5,000 cells well-1) and allowed to attach for 24 hours in standard R&G growth media before removing the media and washing off any unattached cells. Cells were incubated for 24 hours in pH-adjusted media at ambient CO2 prior to measurement of ATP-activity using an ATPlite-assay (PerkinElmer) and measurement of luminescence using a MicroBeta-counter (PerkinElmer). Cell vitality was additionally assessed with the WST-1 cell proliferation reagent (Roche, Mannheim, Germany). Viable cells reduce the WST-1 reagent to a water-soluble formazan dye. The absorbance at 450 nm correlates to the vitality of the cells. Briefly, adult human keratinocytes (5,000 cells cm-2, passage 3) were seeded in 96-well plates. After 24 hours, the medium was changed to the pH-adjusted media and cells were incubated for 24 or 48 h, respectively. Subsequently, WST-reagent was added to the wells for two hours and the absorbance at 450 nm was measured using a TECAN infinite F200 plate reader (TECAN, Crailsheim, Germany). Experiments were undertaken with six replicates per treatment. For 2D wound healing assays, wells of a 24-well plate were incubated with 500 µl of a 10 µg ml-1 fibronectin/PBS (Sigma-Aldrich) solution (10 µg cm-2) overnight. Afterwards, adult human keratinocytes (passage 3) were seeded into wells (5,000 cells cm-2). At confluency, we scratched the cell monolayer using a pipette tip and the medium was changed to the pH-adjusted media. Pictures of the monolayer movement were taken after 0, 12, 24, and 48 h. Experiments were undertaken in triplicate. For 3D wound healing assays, fibroblasts, FCS and bovine collagen I (Nutacon, Leimuiden, Netherlands) were brought to neutral pH and poured into 3D culture filter inserts for 6-well plates with a growth area of 4.2 cm2 (BD Biosciences, Heidelberg, Germany). After cultivation for several hours at 37°C, pH-adjusted medium was added and the system was transferred to an incubator (5% CO2, 95% humidity). After a second incubation, primary human keratinocytes were added on top of the collagen matrix. On the next day, the construct was lifted to the air-liquid interface and medium was changed to a differentiation medium . After 2 days, we induced a wound by scratching the epidermal layer with a needle. The injured constructs were incubated with pH-defined media (pHe 6.5 and 7.4). To mimic in vivo wound healing more closely, 50 µl of the media (simulating wound fluid) were applied onto the epidermal layer. After 48 h, the skin constructs were punched, embedded in tissue freezing medium and kept at -80°C overnight. Subsequently, the skin constructs were cut vertically into slices (10 µm thickness, Frigocut 2800 N, Leica, Bensheim, Germany) and stained with conventional haematoxylin and eosin (H&E). Human primary epidermal foreskin keratinocytes were cultivated (37 °C, 5% CO2) in EpiLife Medium supplied with 1:100 human keratinocyte growth supplement (HKGS, S0015, Life Technologies, Darmstadt, Germany). Cells were passaged every 2-3 days and used for migration experiments at passage 4 or earlier. Microfluidic channels (µ-Slides Chemotaxis 3D, ibidi, Martinsried, Germany) were coated with 70 µg ml-1 Fibronectin (Sigma, Germany), dried, and filled with 2-3 x 106 cells ml-1. The cells adhered for 2-4 h before the pHe-gradient was established by filling the two feeding reservoirs of the µ-Slides with Medium 199 (Life Technologies, Darmstadt, Germany) adjusted to pHe 7.4 and 6.4, which was supplemented with 1:100 HKGS and 5 or 50 µM 2´,7´-bis-(2-carboxyethyl)-5-(and-6)-carboxyfluorescein (BCECF, Life Technologies, Darmstadt, Germany) for pHe-visualization. Cell migration and pHe-gradient stability was monitored at 37 °C and ambient CO2 conditions for a time period of 14 or 16 h by using a fully automated microscope system (Cell^R, Olympus, Hamburg, Germany) equipped with a 4 x phase-contrast objective (UPLFLN4XPH/0.13, Olympus, Hamburg, Germany). Phase-contrast images were taken every 2 min. Fluorescence images (λex 434/17 nm and 492/18 nm, λem 530/20 nm) were taken alternately at 1 or 30 frames h-1 and at 10 or 300 ms exposure time, respectively. Cell migration data analysis was performed using ImageJ software (http://rsbweb.nih.gov/ij/) including the plug-ins Manual Tracking (F. Cordeliers, Institut Curie, Orsay, France) for imaging single-cell migration tracks, and Chemotaxis Tool (ibidi, Martinsried, Germany) to calculate migration velocity, yFMI, accumulated distance, and endpoint y. We used Daniel´s XL toolbox (http://xltoolbox.sourceforge.net) plug-in for Microsoft Excel (Microsoft Corporation, Redmond, WA, USA) to spread scatter plots. The Cell^R image processing software (OlympusSIS, Muenster, Germany) was used for ratiometric analysis of BCECF fluorescence images. Adult human epidermal keratinocytes (Gibco) were cultured in triplicates under different pHe. 150 µl supernatants of cell culture were collected after 48 h. Samples were tested using a 16-Plex human cytokine array (Quansys, Logan, UT, USA) according to manufacturer´s protocols. Chemiluminescence images were acquired by BioRad Versa Doc 4000 MP workstation (Bio-Rad, Munich, Germany) using a gain of 2X, binning of 1X1 and auto exposure time settings. Images were exported as 16 bit TIFF raw data for quantitative analysis using the Q-View software (Quansys). Punch biopsies from wound margins, wound centers, and intact surrounding tissue were taken from patients with chronic venous wounds (ulcers). Wound samples were cut in half along a central line to allow sufficient specimens for immunohistochemistry (IHC), quantitative reverse transcription PCR (qRT-PCR) and Western blots. Allprotect Tissue Reagent (Qiagen, Germantown, MD, USA) was used for preservation. Chronic wound biopsies were fixed in paraformaldehyde and routinely processed for paraffin embedding. After blocking with 5% BSA in phosphate buffered saline supplemented with 0.1% Tween 20, sections were incubated with primary antibodies (NHE1 and ATP6V1B1/B2: Santa Cruz Biotechnology; MCT1: Millipore, Billerica, MA, USA) at room temperature for 1 h followed by several washes in PBS and incubation with fluorescently-labelled secondary antibodies, namely Alexa Fluor 594 goat anti-rabbit IgG (H+L) and Alexa Fluor 488 goat anti-mouse IgG (H+L) (Invitrogen). Images were acquired using an Olympus Bx63 epifluorescence microscope (100x/1.4 NA objective), and image processing (intensity adjustment only, quantitatively equal for all samples) was performed in Adobe Photoshop (Adobe Systems). Total RNA and proteins were isolated from wound biopsies from human patients using the RNeasy Mini Kit (Qiagen) according to the manufacturer's instructions. RNA aliquots were stored in a -80 oC freezer and extracted protein was stored at -20 oC. For gene expression analysis, isolated total RNA was reverse-transcribed using Sensiscript RT Kit (Qiagen), and cDNA-transcripts were amplified by qPCR using SYBR Green (Applied Biosystems, Cheshire, UK) and primers designed using Primer-BLAST from NCBI. Triplicate samples were used. Expression levels of mRNA were evaluated using the comparative threshold cycle (Ct) method as normalized to β-actin. Relative expression levels of mRNA were calculated between tissue sections. To assess protein expression, proteins isolated from each patient's wound section were fractionated by 10% sodium dodecyl sulfate-polyacrylamide gel electrophoresis (SDS-PAGE) and transferred to a polyvinylidene difluoride (PVDF) membrane. Blots were then probed with respective primary antibodies specific for each protein: β-actin (A5316 from Sigma-Aldrich; NHE1, MCT-1 and ATP6V1B1/B2 from Santa Cruz Biotechnology, CA, USA). Dilutions were made according to the manufacturer's recommendation. After incubation with respective primary antibodies, the membranes were washed in tris-buffered saline supplemented with 0.1% Tween 20 and incubated with the appropriate secondary antibodies (Sigma-Aldrich) followed by development with the BCIP/NBT phosphatase substrate system (Pierce Biotechnology, Rockford, IL). β-actin served as loading control. We used Sigma Plot 11.0 (Systat Software Inc., Chicago, IL, USA) for all analyses. Data are given as mean ± standard error of the mean (s.e.m.) except otherwise denoted. We considered a p-value below 0.05 as significant. Results were marked as significant with asterisks within the graphs. We utilized one-way ANOVA and post-hoc Tukey-testing to analyze differences between mean pHe-values in the 5 defined wound regions. One-way ANOVA and post-hoc Holm-Sidak testing were conducted to assess for statistical differences in proliferation and viability of keratinocytes at varying pHe. To check for differences in migration velocity, y-FMI, directionality, and endpoint y, we performed one-way ANOVA on ranks and post-hoc Dunn´s testing. Multiplex ELISA results were analyzed using one-way ANOVA and post-hoc Tukey-tests or one-way ANOVA on ranks and Dunn´s post-hoc test. To detect differences in qPCR data, one-way ANOVA and post-hoc Tukey tests were used. Figures S1-S10. Tables S1-S2. Still Image for Movies. The work was supported by grants of the German Research Foundation (DFG, BA 3410/3-1, BA 3410/4-1, SCHA 1009/7-1, WO 669/9-1), and the ReForM-B program (S.S., University Medical Center Regensburg, Regensburg, Germany). The work was supported by the German Research Foundation DFG within the funding program open access publishing. We thank Beate Morgenstern (Fraunhofer IBMT, Potsdam, Germany) for cell culture assistance and Heiko Siegmund (Center for Electron Microscopy, Institute of Pathology, University Medical Center Regensburg, Regensburg, Germany) for his work on transmission electron microscopic imaging. S.S., R.J.M., O.S.W., and P.B. designed research. S.S. conceived functional experiments. S.S., R.J.M., M.K., S.C.K., S.G., O.F., S.K., J.R.S., K.W., K.T.W., M.A., U.S., and J.S. performed experiments. S.S., R.J.M., M.K., O.F., J.R.S, S.F.P., and P.B. analyzed the data. C.M., L.P., C.D., M.G., M.B., O.S.W., and M.L. helped to analyze data. S.S., O.S.W. and P.B. obtained grant support. R.J.M., M.K., S.C.K., S.G., O.F., S.K., J.R.S., S.F.P., and P.B. wrote parts of the manuscript. S.S. compiled and wrote the final manuscript.